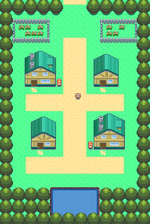 Twinleaf Town (フタバタウン, Futaba Taun, Futaba Town in original Japanese) is the town in which you and your rival reside and from which you begin your journey across the region of Sinnoh. Go down the stairs of your house. Walk outside and there you will see 4 houses. Your house is the bottom right. Your rival's house is the top left. The other two houses contain other, non-important families. The game starts out with you watching a TV program called "Search for the Red Gyarados". After it is finished, walk at least one tile. Your friend (and later rival), Barry, will come inside, rowdy as usual. He'll take a look at your PC, and then run off. When you go downstairs, your mom will speak to you and tell you what Barry wanted. Go to his house to see him. It's the house in the northwest of the town. When you go inside his house, go upstairs. He'll be in his PC, taking things out. He'll then run off again, saying he'll put you into bankruptcy if you don't get to Lake Verity on time. Now, time to go. The game starts out with you watching a TV program called "Ask Prof. Rowan". After it is finished, walk at least one tile. Your friend (and later rival), Barry, will come inside, rowdy as usual. He'll take a look at your PC, and then run off. When you go inside his house, go upstairs. He'll be in his PC, taking things out. He'll then run off again, saying he'll put you into bankruptcy if you don't get to Route 201 on time. Now, time to go. Odd Keystone - This is found in a clump of trees at the bottom of the patch of water, and Surf is required to reach it. You can use Surf outside battle after the 5th Badge is obtained. This page was last edited on 23 October 2015, at 13:34. This page has been accessed 65,620 times.